What that means in practical terms is that there’s a mud Slip N’ Slide on the course. 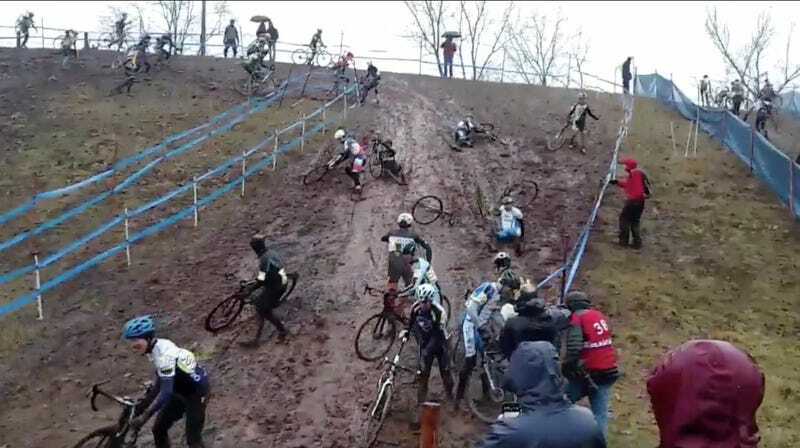 Please enjoy the racers in the 50-59 men’s race struggle to navigate the descent. The decade-younger bunch navigated it far better, aside from the poor schmuck who ended up crotch-first into a pole. Unfortunately, the course appears to have dried out a bit. Let’s hope it rains some before mighty Jeremy Powers and the rest of the elite racers shred it.